Looking for Creative Soap Making Ideas? Or natural soap making ingredients? Either way, I’ve got you covered! I’ve learned a lot of commercially made soaps include ingredients that aren’t great for your skin. And sometime aren’t great for your health either. Just pick a bar soap and look at the soap ingredients on the back. If it includes any of these five ingredients, put it back! This post contains some affiliate links for your convenience, read the full disclosure policy. Just because you’re skipping commercial ingredients doesn’t mean your handmade soap has to be boring! You can still color soap any shade with natural food coloring and more ideas below. Not mention, you can create unique textures and patterns too using natural soap making ingredients. Many are drawn to the fresh scent and bright colors of citrus fruits. Orange, lemon, grapefruit, or lime all make wonderful additions to soap. Citrus fruits are high in antioxidants and vitamins A,B, and C. All of which helps to combat free radicals and lend a radiant glow to skin. Use citrus rinds and powders to color and scent soap, in addition to exfoliation. Try DIY lemon zest soap, perfect for everyday kitchen clean up! Old Fashioned Rolled Oats, colloidal oatmeal, and quinoa are great all-natural skin softening additions to for natural soap making. The cellulose and fiber from the oats make an effective skin soother for itchy, irritated dry skin. The process of grounding oatmeal and suspending it in liquid creates colloidal oatmeal that is more readily absorbed into the skin. Add to your next natural soap recipe or start with an oatmeal soap base! Most known for a morning caffeine jolt, coffee can give your skin a jolt too! It’s packed full of antioxidants, making it naturally anti-aging and detoxifying too. Best of all, it is a natural astringent that makes your skin tighter and firmer. And who doesn’t love the aroma of coffee? Check out this beautiful coffee soap from Hello Glow. Popular for its scent, lavender is a lovely natural soap making ingredient. Known to promote restful sleep, it’s a no-brainer to include in soap. Make DIY lavender goat milk soap for relaxing bath with dried lavender buds. This pairs well with citrus scents and makes a beautiful natural soap ingredient. As a carrier oil, coconut is packed with intense moisturizing benefits for the skin. Did you know you can buy coconut soap base? Learn more about using carrier oils with the Oils By Skin Type Chart in the Resource Library. 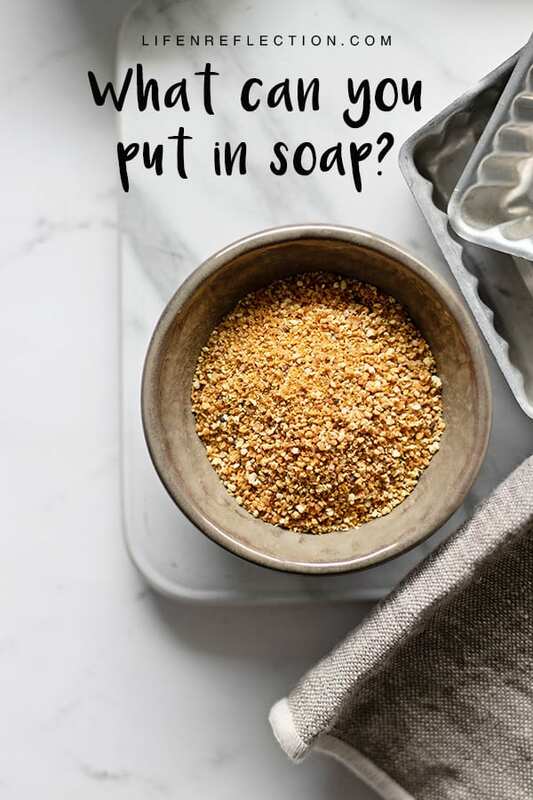 Poppy seeds, apricot seeds, and chia seeds are a clever way to add exfoliation to soap bars. And I love how they appear to float within the soap. Check out this gorgeous Chai Seed and Aloe Soap recipe. Remove dead skin cells and replenish skin with Pink Himalayan salt! Mineral salts break down the build-up of lactic acid with the help of electrolytes to reduce muscle aches and pains. Salt in any form also hardens soaps and provides exfoliation. Make pink grapefruit exfoliating DIY soap, perfect for a lightweight daily exfoliation. Rich in antioxidants, anti-inflammatory, anti-aging properties, green tea has amazing beauty benefits. It can be applied in an abundance of natural ways to help smooth, hydrate, tighten, and brighten your skin. Add as loose leaf tea for exfoliation or matcha powder for color. I love the soft green color it makes in these DIY Match Matcha Bath Melts. Have you seen these in person, or held them in your hand? 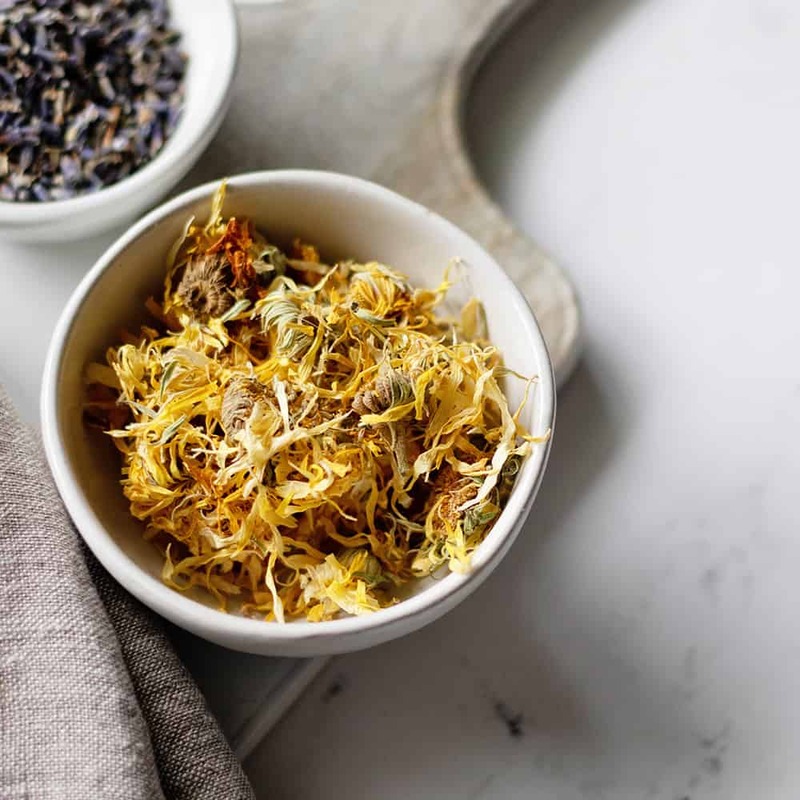 Dried calendula flowers are big compared to most dried herbs. And the color doesn’t fade in soap like other herbs. P.S. If I’m not using herbs from my garden I buy them certified organic from Pronounce Skincare. Rich in antioxidants called flavonols cocoa powder is a multipurpose natural soap making ingredient. How? Flavonols are a powerful antioxidant which fight free radicals making skin youthful for longer! How’s that for multipurpose? Rose is well known to soothe, soften, brighten, and tighten the skin. Rose petals are a beautiful natural soap making ingredient. And the scent is powerful! Don’t miss these 10 ways to harness the power of rose in skin care recipes. There’s something to be said for activated charcoal unmatched ability to remove toxins from the body. It works like a vacuum to remove all the gunk deep within our skin. Not to mention you can use to make a marble appearance in soap like this recipe for Charcoal & Lavender Soap. As an antioxidant, vitamin E oil helps to protect cells from free radical damage. It is a great moisturizer for the skin and hair. Use vitamin E oil as a soap additive in your next soap bar. Used around the world as relaxing bedtime tea, chamomile has incredible skin benefits. Its gentle nature is anti-inflammatory that calms dry itchy skin. And chamomile flowers add a beautiful scent and decoration to soap. If you’re looking for a natural soap ingredient to add powerful scents – essential oils are it! They not only provide wonderful natural scents to soap they also contain a wealth of skin loving properties. 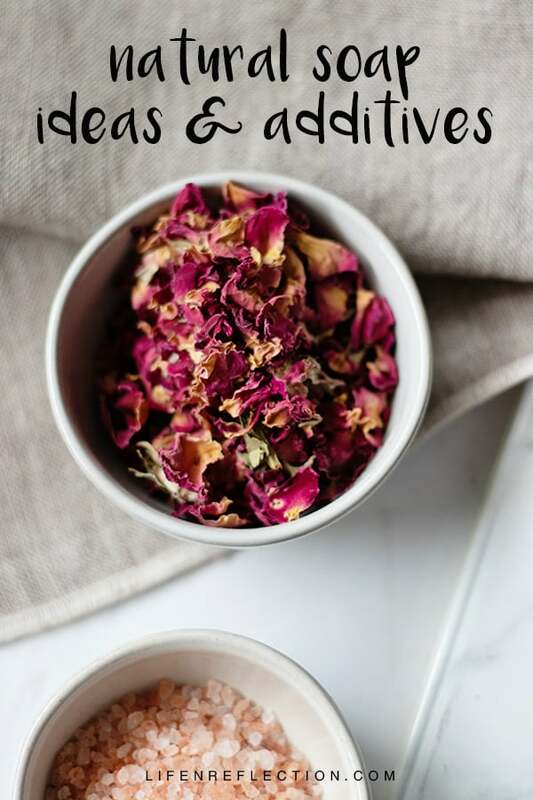 Learn more about how to get started with essential oils and don’t miss my 10 must have essential oils for home and beauty here. Rosemary’s natural antibacterial and antiseptic properties make it a great natural soap making ingredient. I love to combine it with lemon, peppermint, or lavender for lovely fresh scent. See just how pretty it is to as a soap additive in this Refreshing Rosemary Citrus Soap recipe. 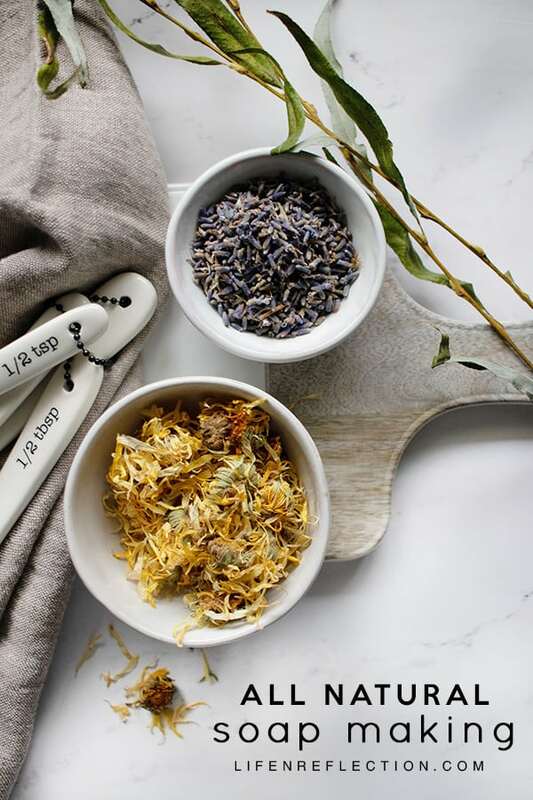 This may seem like an odd addition, but loose leaf tea is quite beautiful in natural soaps. I love to add herbal teas to soaps and bath tea recipes. It’s fun to recreate your favorite drink into a soap bar! I started using beet root powder to color soap, bath bombs, and other natural skin care goodies because it only takes little with such a rich hue. Later I found out it has numerous benefits for the skin such as potassium, folate, vitamin C, and antioxidants! A natural resource of nutrients, vitamins, enzymes, and skin-boosting acids, honey is a natural soap making ingredient to love! Honey is a natural humectant that draws in moisture, antibacterial, and full of antioxidants! You can even start with a honey soap base for DIY soap. Imbedded in soap a loofah helps exfoliate dry skin, allowing your moisturizers in soap to fully nourish your skin and leave it feeling ultra smooth! I love this DIY Lavender Loofah Soap from Crystal at Pumpkin and a Princess. 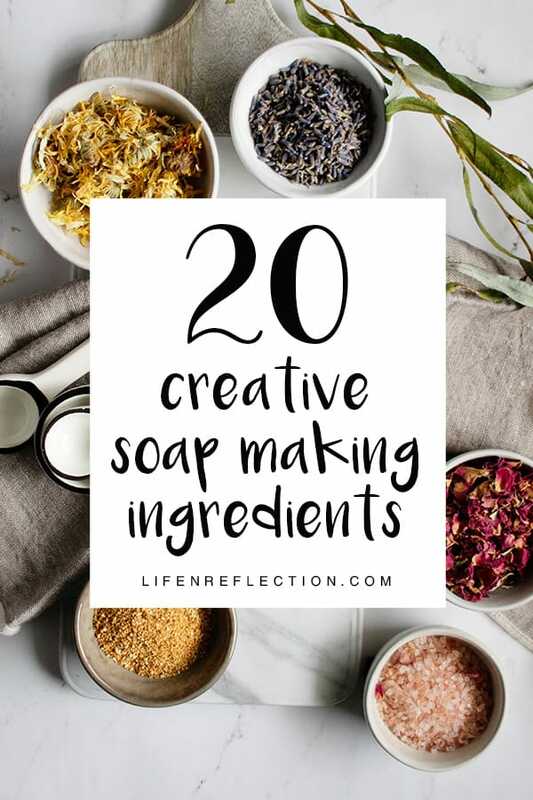 What creative soap making ingredient are you going to try first? 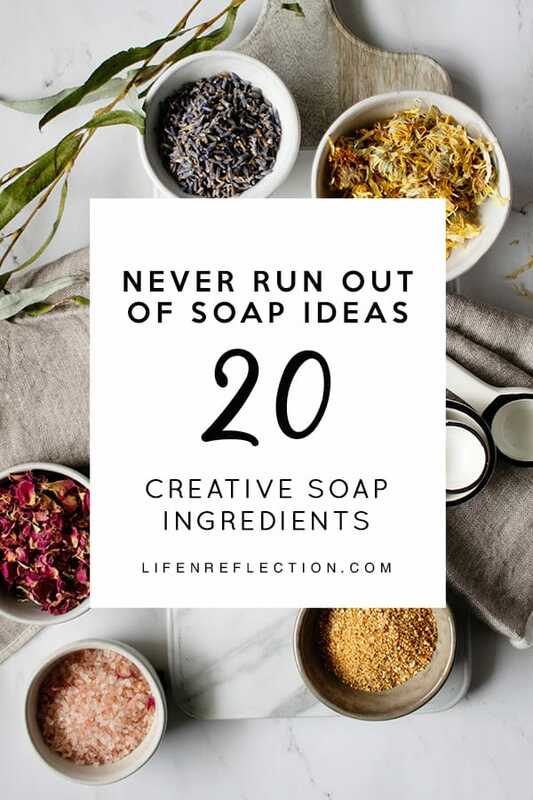 Pin this for later so you never run out of soap making additives and ingredient ideas!